NEW YORK (AP) — Clayton Kershaw of the Los Angeles Dodgers and Max Scherzer of the Detroit Tigers breezed Wednesday to baseball’s Cy Young Awards. Kershaw won the prize as the National League’s best pitcher for the second time in three seasons after posting a 1.83 ERA — lowest in the majors in 13 years. The 25-year-old lefty with a big-breaking curve drew 29 of 30 first-place votes from members of the Baseball Writers’ Association of America. Adam Wainwright of the St. Louis Cardinals was picked first on one ballot. Kershaw went 16-9 and topped the NL with 232 strikeouts. He also won the Cy Young Award in 2011 and finished second last year to knuckleballer R.A. Dickey. Scherzer took the AL honor after leading the majors with 21 wins. He received 28 of 30 first-place votes. The right-hander lost only three times and was the lone 20-game winner in baseball. He ranked second in the majors with 240 strikeouts and was fifth in the AL with a 2.90 ERA. Scherzer smiled and raised both arms when the results were announced. “It’s unbelievable. It just vindicates everything I’ve done,” he said, acknowledging all the run support he received from Detroit’s powerful lineup probably helped his candidacy. Yu Darvish of the Texas Rangers was second, marking the highest finish by a Japanese-born pitcher in Cy Young voting. Hisashi Iwakuma of the Seattle Mariners came in third. Wainwright went 19-9 for St. Louis and finished behind Kershaw. Miami right-hander Jose Fernandez, picked earlier this week as the NL Rookie of the Year, was third. Kershaw’s win marked the record 11th time a Dodgers pitcher has won the Cy Young since the award was first presented in 1956. Sandy Koufax won three times, and the Hall of Fame lefty has developed a friendship with Kershaw. Voting for the Cy Youngs was done before the playoffs began. Kershaw went 1-0 in two sharp starts against Atlanta in the division series, then lost twice to St. Louis in the NL championship. The Cardinals tagged him in a 9-0 romp in the clinching Game 6. “We came up short. I didn’t pitch the way I should have in the last game,” he said. Kershaw has been an All-Star the past three seasons and put up eye-popping statistics. Now, he said, the only thing left for him to do is win the World Series. “I want that ring,” he said. Wainwright, still looking for his first Cy Young Award, has been runner-up twice. The 29-year-old Scherzer won his first 13 decisions of the season, made the All-Star team for the first time and started for the AL. 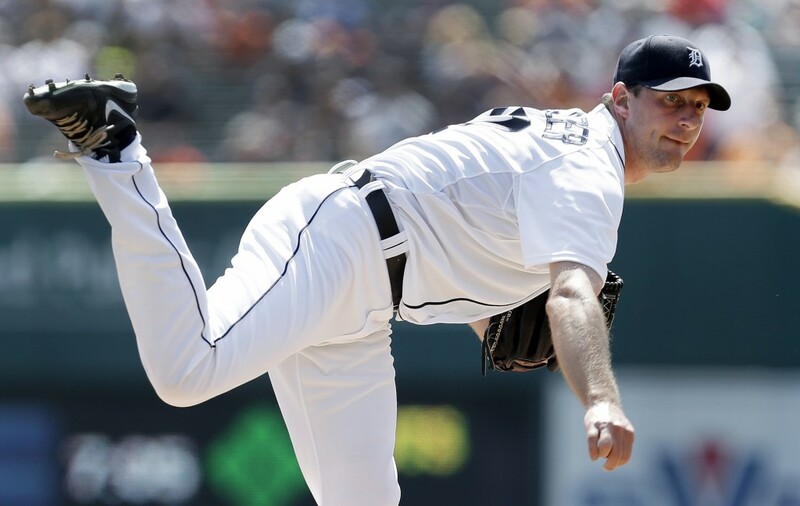 He helped pitch the Tigers to their third straight AL Central title, joined in a deep rotation by Justin Verlander, the 2011 AL Cy Young Award winner, Anibal Sanchez and Doug Fister. Scherzer went 16-7 last year, then added a curveball to an impressive repertoire that already included a hard fastball, slider and changeup. He twice beat Oakland in the AL division series, then went 0-1 in two starts against Boston in the AL championship series — he was pulled both times with the Tigers ahead. Scherzer is distinctive for more than just his record. His eyes are different colors, with the right blue and left brown. Darvish led the majors with 277 strikeouts and went 13-9 with a 2.83 ERA. The Japanese-born Iwakuma was 14-6 with a 2.66 ERA and 185 strikeouts for the Mariners. The AL and NL Most Valuable Player awards will be presented today.